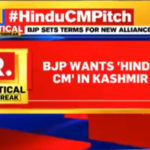 BJP Is Insisting On Hindu CM in Jammu and Kashmir Dr. Jitendra Singh could be front runner. There could be two Deputy Chief Ministers: Sajad Lone and Imran Ansari. Dissenting PDP MLAs to support BJP. Advertisement Download New Version Of Jkalerts App. Existing user Please Update ! !